The Lone Buffalo Cleared Unexploded Bombs And Boosted Needy Kids : Goats and Soda That's the nickname for a Laotian man named Manophet. He died from a brain clot five years ago, but his spirit lives on. As one kid puts it, "I should learn, I should try. I love Lone Buffalo." 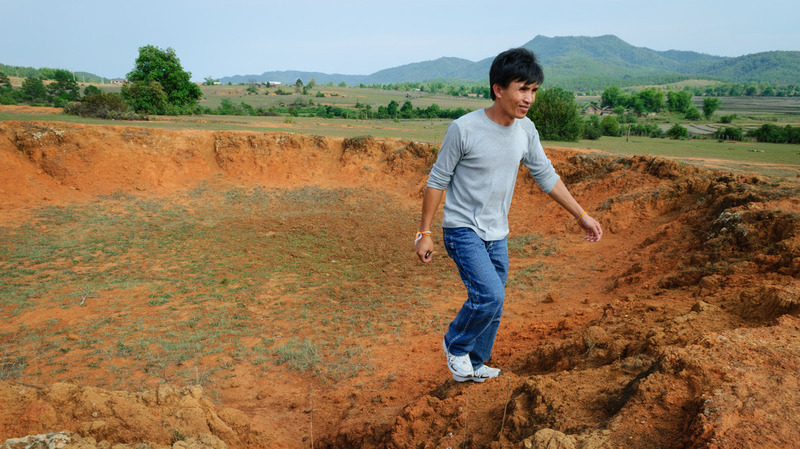 Manophet climbs out of a crater in rural Xieng Khouang, Laos — a remnant of the U.S. bombing campaign during the Vietnam War. The Lone Buffalo is gone but his spirit lives on. That's the nickname used by Manophet. I met him in Laos a decade ago while researching the unexploded bombs dropped by the United States during the Vietnam War. Manophet knew all about the ordnance left behind: an estimated 80 million bombs along with tons of metal. Adults and children in rural areas, where jobs are scarce, often collect the scrap metal to supplement their meager incomes. "They do not know some of the metals still have explosives in them," Manophet told me. Unexploded ordnance (UXO) has killed and injured more than 20,000 Laotians in the past 40 years. Just a fraction of the heavily bombed areas have been cleared by professional teams. As the United States commemorates the 50th anniversary of the Vietnam War, this often-forgotten legacy of UXO remains next door in Laos. 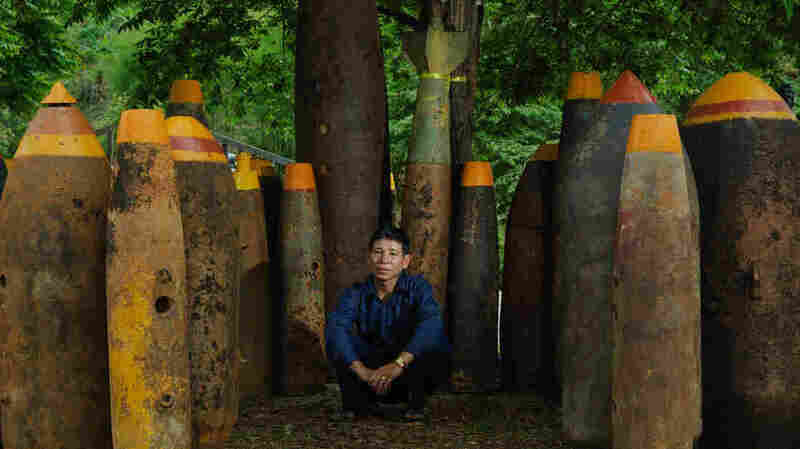 Sang Kham poses amid some of the thousands of bombs he has defused. He's turned the weapons into a shrine to victims of the U.S. bombing campaign. In April 2010, Manophet took me toward the Vietnam border, to interview a banana farmer named Sang Kham who defused bombs as a side job. He and his wife, Bounmee, encircled their yard with a fence of old bomb casings. "We want to keep it as a reminder to see how much the older generation suffered during the war, how many of their grandparents were killed," Bounmee said. Less than three weeks later, a mutual friend messaged me on Facebook. "I have some incredibly sad news," she wrote. Manophet had died the day before, struck by a blood clot in the brain. That summer, Manophet had been scheduled to take his soccer team to the Gothia Cup, an international tournament in Sweden. No Lao youth soccer team had ever competed abroad. The kids were devastated. Their teacher's sudden death "took all students' tears," two of the kids, Bao Yangsaoye and Chewly Chang, recently wrote in an email. That's when Mark Steadman, a British adventure tour leader, stepped in with his friend, Gareth Carter, to form the Lone Buffalo Foundation, in honor of Manophet. The players proceeded to Europe, made the semi-finals and returned home with a trophy. 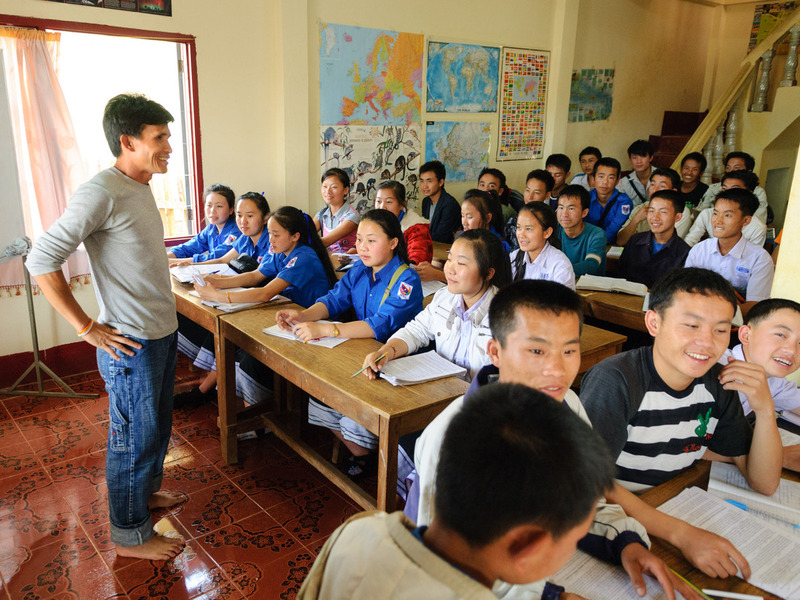 Manophet talks with an English language class at the school he set up in a house on the outskirts of Phonsavan, Laos. Steadman decided to do more in Manophet's name. "I realized there was a huge gap in the community left by his passing," he says. "Whilst 14 boys playing football in Sweden was amazing, I felt I needed to do something that could benefit all." He met with a friend named Nick Williamson, who had been teaching in Vietnam, and told him, "Let's go back to Laos and open a school. You teach, I'll do the rest." They raised several thousand dollars in a crowdfunding campaign, bought a load of supplies, "put it on the overnight bus" and opened the school's doors to about 100 students in 2012. In the past three years, the organization, a registered British charity, has expanded and thrived, continuing to offer English lessons, workshops for teachers and soccer coaching for boys and girls. Classes remain free, and that's key. "There are 13 people in my family," a student named Por Xiong said in an emailed message. "My parents are farmers. We don't have a lot of money." Lone Buffalo was the only chance for him to learn English—a critical skill that could shape a Lao kid's future. At first, "I didn't know how to write or how to listen, and I felt very exited and worried." But he knew the education could change his future. "I should learn, I should try," he wrote. "I love Lone Buffalo." Some of the kids say the "Lone Buffalo" reflects a solo spirit who keeps on doing, keeps on moving, even if alone. "Lone Buffalo is everything to me," said a student named Bie. Continuing Manophet's teachings on bomb safety is also critical. Last April, Lone Buffalo took about 80 students to UXO Lao for a briefing. Then the kids packed into a bus and visited a clearance site to witness teams at work. Now, thanks to a U.S. State Department grant, Lone Buffalo students are working with a photographer, Jon Witsell, to produce a UXO awareness film. They will create a script and lesson plan that teachers across Laos can use to spread the film's message without needing DVD players, which are scarce in rural schools. The entire video will be filmed through the eyes of the students. "This is important," Steadman said. "We want to know how young students want to get that message across. It will be their ideas, not mine or Jon's." The kids will have access to video gear and instructional workshops. Steadman hopes to foster a "culture of filmmaking" as a way to instill creativity and independent thinking among Xieng Khouang's youth. Five years after his death and 50 years after the start of war, it's exactly what Manophet would have wanted: a legacy of hope in the face of danger.